The global luxury furniture market basis its soaring profits on unwavering branding and marketing strategies. The steady rise of this market can be attributed to the legacy of designer furniture brands and their art-like collections. Transparency Market Research predicts that the global market is poised to see newer heights in the coming years as the number of high net worth individuals is increasing. Furthermore, the mushrooming real estate industry and improving disposable incomes in developing countries are also likely to propel market growth in the near future. The market’s progress will also be a result of the emergence of the various distribution channels, especially e-commerce. The convenience of shopping and making payments has surely made a positive difference to the revenue of the global market. The research report states that the global luxury furniture market is likely to be worth US$22,937.6 mn by the end of 2017, only to reach US$29,496.7 by the end of 2022. Between the years of 2017 and 2022, the global market is slated to register a steady a CAGR of 5.2%. Rapid urbanization and increasing disposable incomes have been extremely important for the soaring profits of the global market. In the coming years, growing number of commercial spaces such as restaurants, hotels, and clubs are likely to be key end users of luxury furniture items as they persistently try to create luxurious experience for the customer. Entry of various designers, focus on providing an opulent lifestyle choice to the end user, and a higher awareness about the artistic value of the luxury furniture have also been identified as the important growth drivers for the global market. Out of the various types of materials used for making luxury furniture, the wooden luxury furniture is likely to sell the most in the coming years. The higher aesthetic value, monetary value, and durability of wood makes it the most preferred material in the luxury furniture market. Between the forecast years of 2017 and 2022, this material segment is estimated to register a CAGR of 5.8%. The other materials used for making luxury furniture goods are metal, glass, and leather. The end users of the luxury furniture are commercial spaces and residential units. The study estimates that commercial spaces are likely generate higher revenue for the overall market as they are the obvious big buyers. Hotels, restaurants, resorts, holiday homes, and luxury stores are some of the key end users of the luxury furniture. Thus, the emergence of these spaces is likely to have a positive impact on the global market. Amongst the residential spaces, demand for luxury furniture in bedrooms and living rooms will be the highest. Geographically, the global luxury furniture market is segmented into Europe, Asia Pacific, Latin America, Western and Eastern Europe, Asia Pacific, Japan, and the Middle East and Africa. Of these, Europe is anticipated to the lead the pack, registering a steady CAGR of 5.1% over the forecast period. On the other hand, China is projected to be the key player in the Asia Pacific region due to growing urbanization and improving disposable incomes. The hospitality sector of the Middle East has been identified as a region that will provide the global market many lucrative opportunities in the near future. 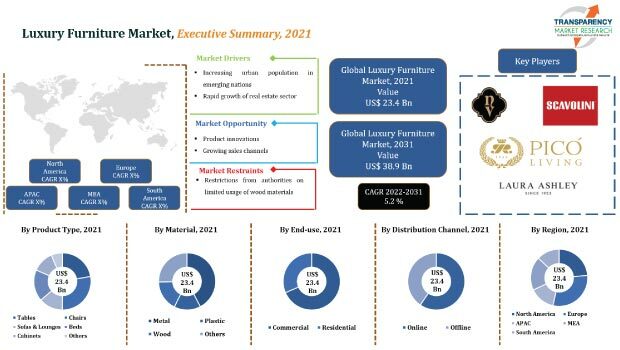 Some of the leading players operating in the global luxury furniture market are Nella Vetrina, Muebles Pico, Scavolini S.p.A., Laura Ashley Folding PLC, Henredon Furniture Industries Inc., Iola Furniture Ltd, Turri S.r.l, Giovanni Visentin srl, and Heritage Home Group LLC. These players are investing in product differentiation through state-of-art designing to stay ahead of the competition. Luxury furniture market is likely to witness a steady growth in the coming years due to a higher consumer awareness. The market has been undergoing a major transformation as distribution channels are expanding. Improving visibility of luxury furniture brands in malls and through online mediums has also benefitted the global market. Furthermore, the improving disposable incomes and the increasing need to match up a higher standard of living have collectively spurred the demand for luxury furniture items in the global market. The research report states that the demand for luxury furniture is also slated to rise as the economies limp back to normalcy. The rise of the real estate market is also projected to have a positive impact on the overall market. The demand for luxury furniture in the hospitality sector such as hotels and restaurants is projected to augment the market. Additionally, restoration and renovation of residential market is also going to win the vendors in the global market several new consumers. The research report on global luxury furniture market includes executive summary, which introduces the market, offers its taxonomy, and provides its definition. The report elucidates the various drivers, restraints, and trends that are likely to impact the trajectory of the overall market. It mentions the supply chain, cost structure, pricing analysis, and raw material sourcing strategy and analysis. These pointers help in understanding the very basis of the market and its overall foundation. The research report has been compiled using primary and secondary research methodologies, thereby giving the readers an accurate and an exact measurement of the growth. The publication provides an exhaustive list of tables and figures for quick and easy navigation of important elements of the research report. The research report also offers a critical evaluation of all the segments of the market. The divisional study of the global market helps in understanding each and every facet that is likely to impact various segments over the forecast period of 2017-2022. On the basis of material, the global market is segmented into glass, metal, plastic, leather, and wood. The research report provides revenue comparison of these segments, market share comparison, and year-on-year growth strategy. On the basis of distribution channel, the global market is fragmented into departmental stores, online sales, independent furniture retailers, and factory outlets. The end users studied in this study are commercial and domestic buyers. Such a detailed break-up allows the readers to examine the market in great depth and with utmost clarity. In terms of geography, the global luxury furniture market is segmented into Asia Pacific, Europe, North America, the Middle East and Africa, Japan, and Eastern and Western Europe. These regions are further broken down into countries to understanding national trends that are likely to impact the market. The research report assesses the factors that will support the regional growth as well as the ones that will restrain it. The research report dedicates a chapter to discuss the competitive landscape of the global luxury furniture market. It profiles some of the leading players in the global market such as Nella Vetrina, Muebles Pico, Valderamobili, Scavolini, Laura Ashley Folding Plc, and Henredon Furniture Industries Inc. It assesses the research and development activities of the key players, their business and marketing strategies, and their financial outlooks. For a holistic understanding, the research report includes comments from the market leaders. The unbiased evaluation of the global luxury furniture market is aimed at allowing the readers to make well-informed business decisions in the coming years.